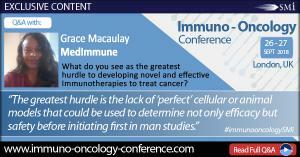 SMi Group reports: Exclusive interview with Grace Macaulay - MedImmune released in the run up to the Immuno-Oncology Conference, 26-27 September, London. LONODON, LONDON, UNITED KINGDOM, July 9, 2018 /EINPresswire.com/ -- SMi is proud to host the inaugural Immuno-Oncology conference this Autumn on 26 - 27 September 2018 in London, UK, with a focus on propagating thought-provoking discussions on novel targeted cancer therapies. SMi Group caught up with expert speaker Grace Macaulay, Global Safety Physician, Patient Safety-Oncology, MedImmune to discuss the challenges associated with developing novel and effective Immunotherapies as cancer treatments, her role in MedImmune, and the future of Immuno-Oncology. Dr Grace Macaulay MBBS, Dip. Pharm Med is a senior safety Physician with Medimmune (Part of AZ). She joined Medimmune in 2014 and has been working on checkpoint inhibitors since then. Prior to Medimmune, she was head of oncology within Patient safety at Ipsen and Mundipharma (Part of NAPP). Dr Macaulay has over 20 years clinical experience in Haematology and Oncology. SMi: What is your role and what do you hope attendees to take away from your talk? Grace Macaulay: My role is global safety physician within IO developmental franchise. The take home message is that as we combine various novel therapies in cancer treatment, we need to be aware of the known and unknown safety of these combinations that could have great impact on the patient wellbeing or quality of life. SMi: What do you see as the greatest hurdle to developing novel and effective Immunotherapies to treat cancer? Grace Macaulay: The greatest hurdle is the lack of ‘perfect’ cellular or animal models that could be used to determine not only efficacy but safety before initiating first in man studies. Dr Macaulay will be presenting on day two of the conference on Key safety challenges in cancer immunotherapy clinical trials, where she will explore Immunotherapy past, present, and future, checkpoint inhibitors, key safety challenges: immune-mediated AEs, ESMO/ASCO guidelines and the way forward: getting the right balance. Also presenting on the topic of Checkpoint Inhibitors, on day one of the Immuno-Oncology Conference, are expert speakers James Legg, Vice President R&D, Crescendo Biologics Ltd, and Loui Madakamutil, Vice President, Discovery and Research, Nektar Therapeutics. Mr Legg is set to present on “Targeting immune checkpoints with Humabody VH therapeutics”, whilst Mr Madakamutil will discuss “Enhanced cancer vaccine effectiveness with NKTR-214, a CD122-biased cytokine”. In addition, interested parties can view other exclusive content and the latest event agenda, as well as book their place for the conference.